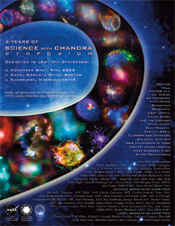 The third in a series, this meeting will highlight science results from the past six years of operation of the Chandra X-ray Observatory with emphasis on recent results. Contributions covering recent results from the XMM-Newton Observatory will also be presented. The Symposium Proceedings are now online. Talks and posters are being added to the proceedings pages daily. Send in your poster! If you presented a poster and have not yet submitted it for the proceedings, email sixyears@head.cfa.harvard.edu for instructions. (high resolution PDF, 3.5 MB). This version of the flyer includes the invited speakers and some of the science topics that will be discussed at the symposium.